The diffraction of a light beam as it propagates through a medium can be effectively compensated by self-trapping. A laser beam propagating through a nonlinear medium can generate a waveguiding action, i.e., a higher refractive index, along the direction of the light propagation. Experiments involving light beams illuminating the front surface of a solid bulk photopolymer sample are reported. 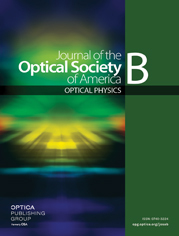 The self-bending of parallel beams (input simultaneously but separated in space) during the resulting self-writing process is studied. It is shown that there is strong correlation between the initial beam input separation distance and the resulting waveguide trajectories taken during channel formation. Finite element-based simulations are performed, which predict the self-writing waveguide formation process, e.g., beam focusing, trapping, and the deviations of the waveguide trajectories caused by adjacent beams. The model is shown to be in good qualitative agreement with observed experimental results.